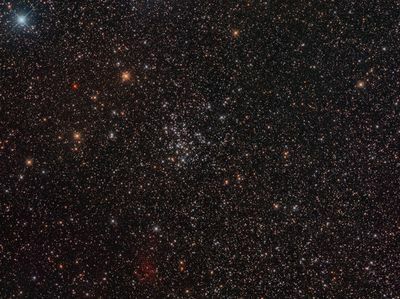 NGC 1528 is an open cluster found in the constellation Perseus. William Herschel described it in 1790 as “A beautiful cluster of large stars, very rich, and considerably compressed”. Below NGC 1528 and to the bottom of the image is the emission nebula Sh 2-209. Image was taken with a Takahashi Epsilon 180 f/2.8 astrograph with a SBIG STF 8300c camera on a Paramount. Image was a combined exposure of 1.5 hours (Dithered 6 x 15 minutes lights @ -20 degrees C guided with a 60mm Baader finder with ST-i; 35 darks; 126 flats; 128 bias). Sub-frames acquired with MaxIm DL 6.07 and calibrated, registered, integrated, and processed in PixInsight 1.8.3.1123 Ripley (x64).